PASADENA, Calif. — Images from NASA's Cassini spacecraft show a concentration of high-altitude haze and a vortex materializing at the south pole of Saturn's moon Titan, signs that the seasons are turning on Saturn's largest moon. This true color image captured by NASA'S Cassini spacecraft before a distant flyby of Saturn's moon Titan on June 27, 2012, shows a south polar vortex, or a mass of swirling gas around the pole in the atmosphere of the moon. Image credit: NASA/JPL-Caltech/Space Science Institute. "The structure inside the vortex is reminiscent of the open cellular convection that is often seen over Earth's oceans," said Tony Del Genio, a Cassini team member at NASA's Goddard Institute for Space Studies, N.Y. "But unlike on Earth, where such layers are just above the surface, this one is at very high altitude, maybe a response of Titan's stratosphere to seasonal cooling as southern winter approaches. But so soon in the game, we're not sure." 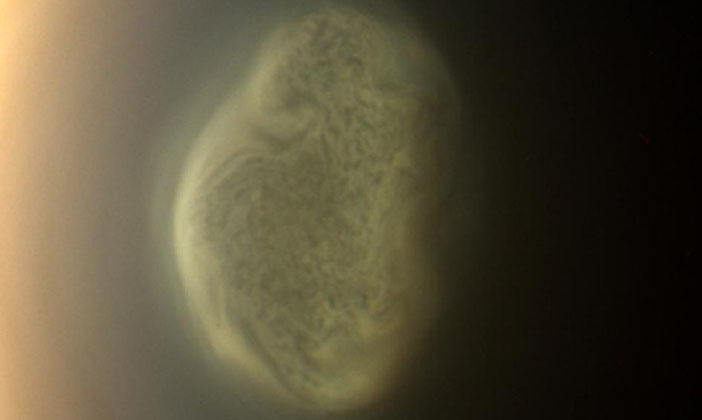 Cassini first saw a "hood" of high-altitude haze and a vortex, which is a mass of swirling gas around the pole in the moon's atmosphere, at Titan's north pole when the spacecraft first arrived in the Saturn system in 2004. At the time, it was northern winter. Multiple instruments have been keeping an eye on the Titan atmosphere above the south pole for signs of the coming southern winter. False-color images from NASA's Cassini spacecraft show the development of a hood of high-altitude haze — which appears orange in this image — forming over the south pole of Saturn's moon Titan. Image credit: NASA/JPL-Caltech/University of Arizona/LPGNantes. While the northern hood has remained, the circulation in the upper atmosphere has been moving from the illuminated north pole to the cooling south pole. This movement appears to be causing downwellings over the south pole and the formation of high-altitude haze and a vortex. 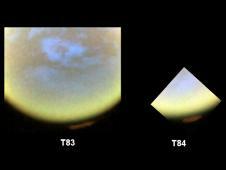 Cassini's visible light cameras saw the first signs of hazes starting to concentrate over Titan's south pole in March, and the spacecraft's visual and infrared mapping spectrometer (VIMS) obtained false-color images on May 22 and June 7. "VIMS has seen a concentration of aerosols forming about 200 miles [300 kilometers] above the surface of Titan's south pole," said Christophe Sotin, a VIMS team member at NASA's Jet Propulsion Laboratory, Pasadena, Calif. "We've never seen aerosols here at this level before, so we know this is something new." During a June 27 distant flyby, Cassini's imaging cameras captured a crow's-eye view of the south polar vortex in visible light. These new images show this detached, high-altitude haze layer in stunning new detail. "Future observations of this feature will provide good tests of dynamical models of the Titan circulation, chemistry, cloud and aerosol processes in the upper atmosphere," said Bob West, deputy imaging team lead at JPL. For more information about the mission visit http://www.nasa.gov/cassini and http://saturn.jpl.nasa.gov. The Cassini imaging team homepage is at http://ciclops.org. This article was originally prepared as a NASA portal Cassini mission news feature.